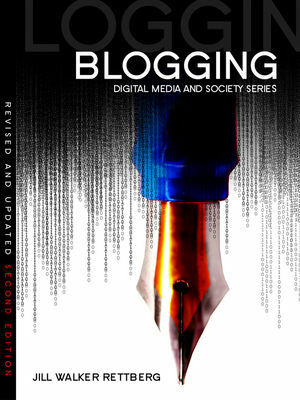 We’re hosting ELO2015: The End(s) of Electronic Literature here at the University of Bergen this week, and we are so excited to see everyone beginning to arrive! We’ve got a fabulous academic program lined up, as well as a series of open arts events (five exhibitions, two performance nights!) that will be open to the general public as well as to the conference goers. The full program is online, of course, and if you’re not in Bergen, some sessions will be streamed and archived. There’s also lots of discussions already on Twitter and Facebook. Too many academic conferences fail at including diverse voices. The recent Digital Humanities conference didn’t have a single woman on stage for the first day, which was of course a topic of debate. Fortunately, the Electronic Literature Organization’s conferences have never been parades of patriarchs. 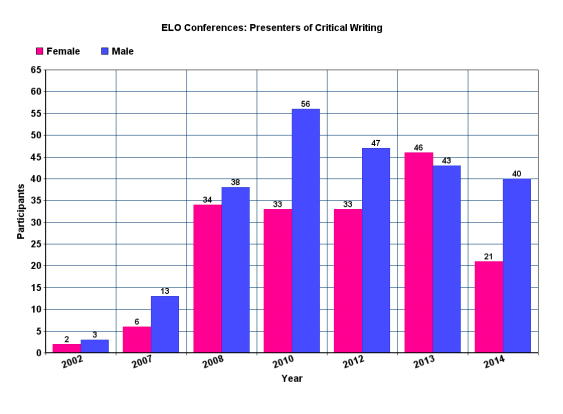 I can say that with confidence, because one of our excellent students, Daniela Ørvik, chose to research gender balance in the ELO conferences in her project for our Digital Humanities in Practice course last year, using data from the ELMCIP Electronic Literature Knowledge Base. I’ll share some of Daniela’s findings later on in this blog post, but first, let’s look at another kind of diversity: where do people attending ELO2015 come from? This is just the second iteration of the annual ELO conference series to be held in Europe, and so I was interested to look at how this broadening of the ELO’s sphere might have affected where the attendees come from. 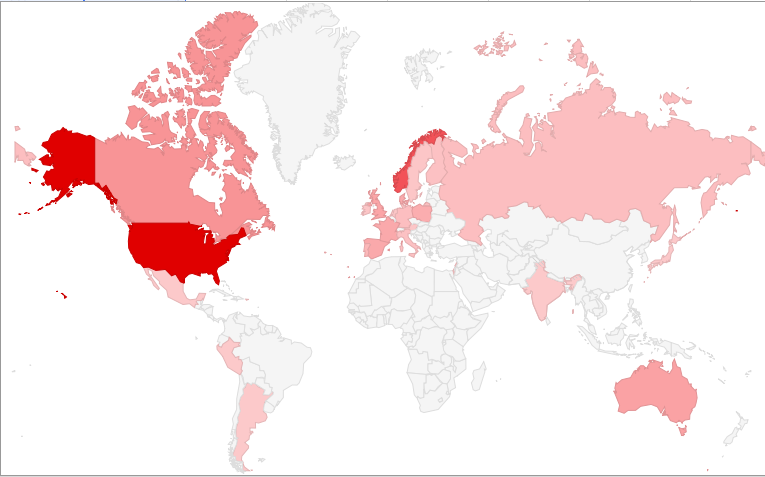 What with all the conference preparations I’m afraid haven’t had time to go through the data from previous conferences (we do actually have speaker info for many of the conferences in the ELMCIP Knowledge Base so could do that later) so I can’t compare to previous years, but I took a look at where this year’s attendees come from. There are 110 Europeans (the big countries being Norway (33), the UK (11) and Denmark, France and Spain with 10 attendees each and Poland with 9), 80 North Americans (64 from the USA and 16 Canadians) and 12 Australians. That’s probably a pretty typical combination of English-speaking nations and Europeans as academic conferences go, although with a much broader spread of Europeans from a lot of different countries than the conferences have usually had (Portugal, Germany, Finland, Italy, Malta, Austria, Ireland, Sweden and the Netherlands are all represented). There are also attendees from Russia, Singapore, India, Japan, Israel, Hong Kong, Lebanon, Mexico, Peru and Argentina, which is wonderful. 27 countries are represented in all. Of course we would have liked even more diversity. It’s hard to figure out how to get the word out to the people you don’t already know about. One thing we tried doing was applying for arts travel grants for some of the artists who submitted works, which did help somewhat, but we weren’t as successful as we would have hoped with this. I do think that having a specific call for an exhibition of global electronic literature helped diversify the conference. So what about our gender distribution? 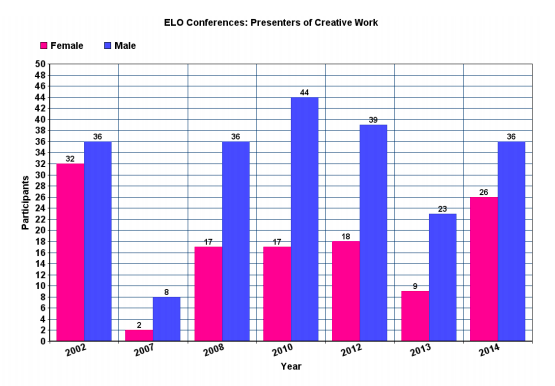 Thanks to Daniela Ørvik, we have good data on gender at the ELO conferences form 2002 to 2014. In total, 758 unique people presented academic or artistic work at these conferences, and 296 (39%) of them were women. As you can see, the number of women presenting is pretty stable from year to year, but the number of men presenting varies a lot. I have no idea why this would be the case – does anyone have any ideas? 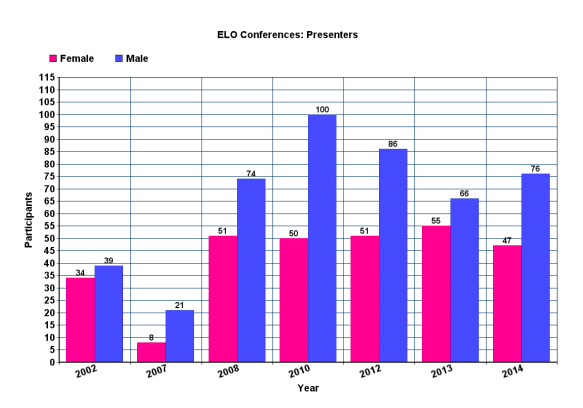 So every iteration of the ELO conference has had more men than women presenting, but compared to many conferences, 39% women isn’t too bad, really. We’re close to that this year too: 75 of 186 of our speakers and artists (just over 40%) are women. Daniela takes her analysis one step further, by splitting it into the presenters of creative work and critical work. That’s a bit more worrying. As you can see, the gender imbalance is greater for creative work than for academic work. Obviously I should go through and count what that looks like this year but I simply don’t have time right now. If you’re in the mood for it you can skim through the presenters yourself – please let me know what the numbers are if you do and I’ll update this post! 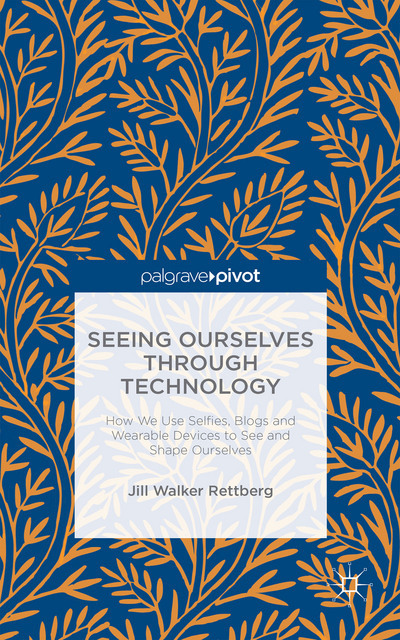 From Daniela Ørvik’s 2015 paper for DIKULT207: Digital Humanities in Practice.. There are many other ways of measuring diversity, too of course, and like most academic conferences run by Western organizations and universities we’re not as diverse as we would like to be. We need to do better. But we’re working on it. I’m really looking forwards to greeting all our visitors on Tuesday. I’m glad that we won’t be seeing “a parade of patriarchs,” and I look forwards to even more diverse conferences in the future, as we learn to become more open to the world and to differences.